While “Jungle Jackpots” may appear to be something of a generic name indicating a pretty typical jungle-themed slots game, the subtitle is key. This game is more properly known as “Jungle Jackpots: Mowgli’s Wild Adventure” and, thanks to the public domain status of Rudyard Kipling’s work, this slot is based on the famous tale recently depicted in a live-action movie. Even better, this slot’s from the casino software designers at Blueprint Gaming, meaning there’s a nicely intricate system of bonus games and nice jackpot rewards. Even the most jaded player should be impressed by the craftsmanship on display in the Jungle jackpots slot. How closely based on Jungle Book is the Jungle Jackpots slot game? All the favorite characters of the classic story are in play here: Mowgli the jungle lad is joined by Bagheera the panther, Baloo the bear and King Louie’s minion monkeys are in the symbol set and/or play important parts in the bonus rounds. How do you play the Jungle Jackpot slots game? The player may wager between 1¢ and $25 per payline on the 20 paylines of Jungle Jackpot. The base game pretty much plays out as normal, though take note of the game logo symbol, which is a stacked bonus symbol. The bonus fun starts with the randomly-triggered Mowgli Bonus, which is triggered *druing* any spin. The gameboard switches graphically after a special effect of a page turning. After the interrupted spin is completed, the player may be rewarded in a multiplicity of ways. These include the “Kaa Locking Wilds”; “Hathi’s Expanding Wilds”; “Monkey Mischief”, which has King Louie’s charges “pulling” symbols into positions which net ridiculous wins – like 18 winning combinations on 20 paylines crazy); Mowgli Wilds (essentially extra wild symbols – lots of extra wild symbols!) and the simply-named “Bonus,” which equals an instant payout. Landing enough bonus symbols on an active payline also unleashes a number of bonus rounds. 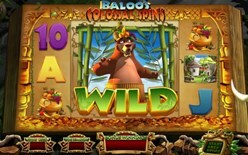 Hit these and the player may enter rounds like “Baloo's Colossal Spins,” in which the huge 3x3 wild blocks are in play; “Bagheera's Free Spins,” with an expanding wild; “Mowgli's Cash Trail,” a feature reminiscent of old-fashioned trail features; or “Baloo's Cash Bonus” pick 'em for prizes up to a max 500x total bet payout. Can I play the Jungle Jackpots slot for free or real money? As the meme goes, “Why not both?” Play Jungle Jacakpots: Mowgli’s Wild Adventure slots games right here for free, along with hundreds of other top-quality slot titles. For rea money play on Jungle Jackpots, simply visit one of the partnered websites linked on this site. Players may be assured that all casinos affiliated with Demo Slot Machines have met requirements for information security and fair play by independent, internationally-approved auditors. You can trust any or all of our partner online casions, so play slots carefree today!